cinnamon | "blackberry-eating in late September"
Around here, we take afternoon snack time very seriously. During the school year, it’s an opportunity to sit down together for a few minutes and work our way through notable moments from the day. During the summer, it’s a good way to reconnect from whatever individual projects we might have lost ourselves in. It feels like a restart, in a lot of ways, which can be important if the day hasn’t gone all that well. 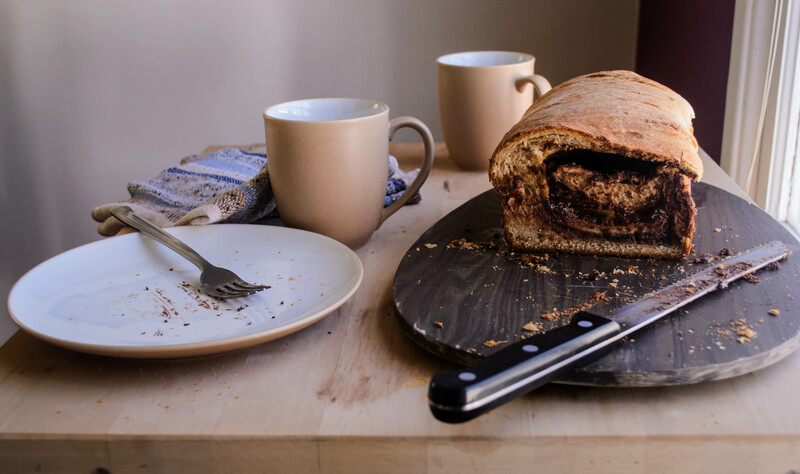 More than that, though, we are gluttons, and our mid-afternoon snack, or “teatime” as my wannabe Londoner husband likes to call it, is a sacred few minutes reserved for cramming something delicious into our mouths. Usually this is something quick: chips and salsa, or crackers and cheese; on Fridays it often dovetails into an impromptu happy hour of some sort (stay tuned for snack-y developments on this front, by the way…). But sometimes I like to get fancy. 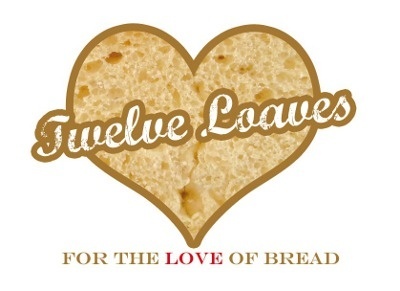 Spurred by this month’s Twelve Loaves theme “A Little Something Sweet,” I decided a special “teatime” loaf was in the works: I wanted a swirled bread, and since N. was working his way through his very last week of school, I decided something with a bit of pick-me-up was called for. Playing with flavors of Mexican chocolate and tiramisu, with a block of cream cheese thrown in for good measure, I ended up with this stunner: a lightly sweet cinnamon spiced loaf, with an unapologetically thick filling of sweetened cream cheese, espresso powder, and chopped semi-sweet chocolate. Yes, please. 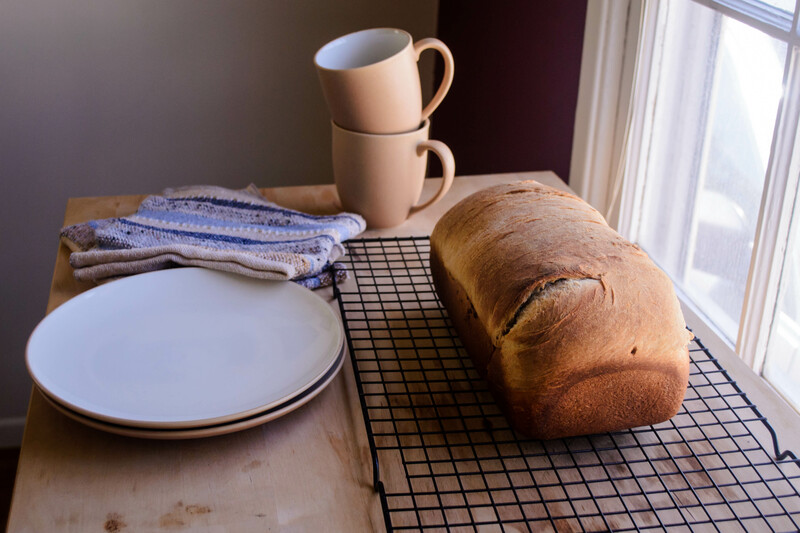 The production of this loaf is fairly standard: a good knead, two rises, with the application of the filling in between, and the better part of an hour in the oven. The most difficult part, honestly, is waiting for the finished loaf to cool enough to slice into it without making a mess. I waited almost long enough. Oddly, despite the Mexican and Italian dessert inspirations, what this reminded me of more than anything else was mocha chip ice cream. You know, the luscious, rich brown scoops with just the right amount of coffee flavor, studded with chunks of dark chocolate. Except in my version, it’s a soft swirl through a moist slice, and the chocolate pieces melt easily on your tongue (one of my biggest complaints about “chip” anything ice cream: the cold, hard chunks of chocolate. I know, I know, first world problems). Obviously, this is a rich bread. I’d say it’s more than a “little” something sweet, but let’s indulge anyway. Unless caffeine doesn’t disrupt your sleeping patterns, I’d stay away from it as a bedtime snack. But as a pick-me-up in mid-afternoon, or mid-morning for that matter, it’s solid. I can imagine thick slices on a brunch table as well, maybe even as part of a bridal shower (colors: espresso and vanilla?) since the presentation is so pretty. But then, I’ve got weddings on the brain this summer. Oh, p.s., like my new “studio” set-up next to the window? My Photo Friday post from the other week had such lovely lighting I decided to make it a more regular shoot location. I’m looking forward to playing more with angles and light at different times of day. In a glass measuring cup, combine the lukewarm milk and the yeast, and let sit for 5-10 minutes to allow the yeast to wake up a bit. While you wait, combine the sugar, cinnamon, salt, vanilla, eggs, and ¼ cup of butter in the bowl of a stand mixer (or just a large mixing bowl). When the yeast and milk mixture is bubbly and smells like bread, add it into the egg and butter mixture and stir well to combine. Add 2 cups of the flour, and stir well to combine again. If you are using a stand mixer, fit with the dough hook attachment and begin to knead on medium speed. 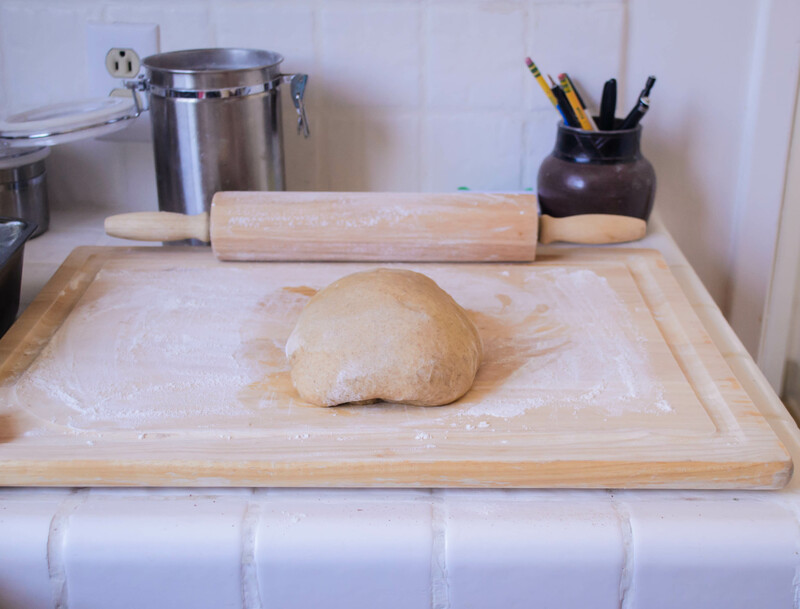 If you are working by hand, dump the dough out onto a floured board and knead for about 5 minutes. As needed, work in more flour ¼ cup at a time until the dough is easy to handle. I ended up using about 2 ¾ cups total. In the stand mixer bowl, it will start to pull away from and then slap the sides. 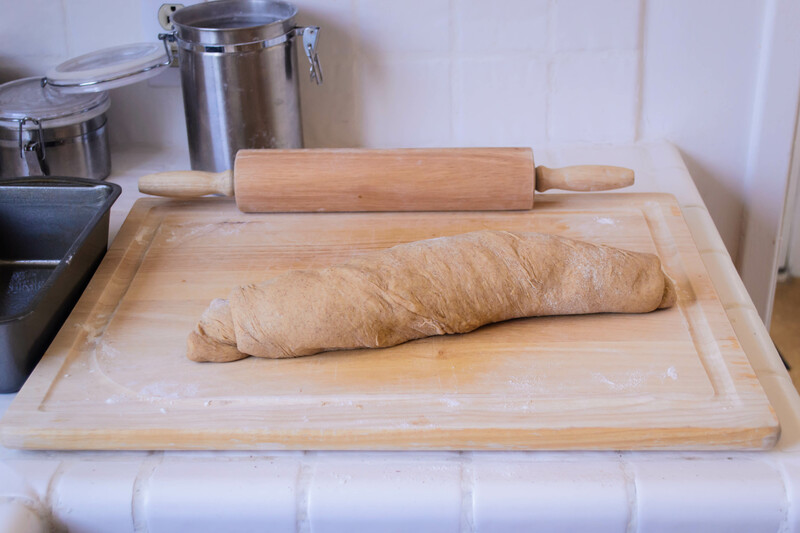 After you’ve kneaded for about 5 minutes, the dough should feel smooth and stretchy and be texturally reminiscent of play-dough. 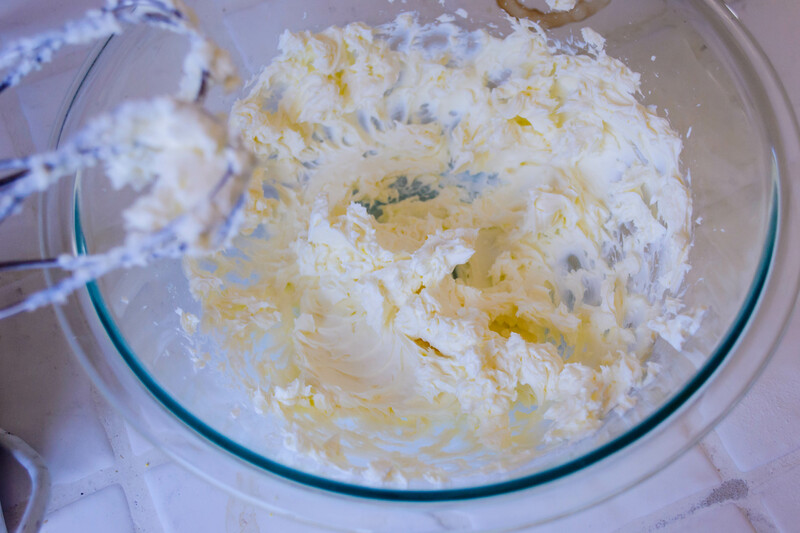 At this point, lightly oil the inside of a large bowl (I use the stand mixer bowl for this – you don’t even need to clean it out), flip the dough around in it to coat all sides, then cover with plastic wrap and set aside to rise until doubled; about 90 minutes. 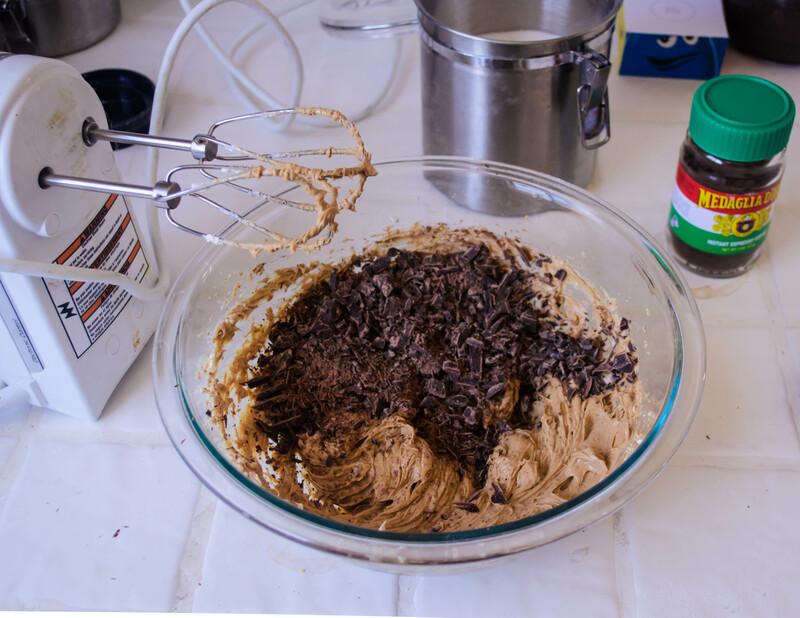 While you wait for the dough, make the filling: in a medium bowl, beat together the cream cheese, espresso powder, and granulated sugar until light and fluffy; 1-2 minutes. 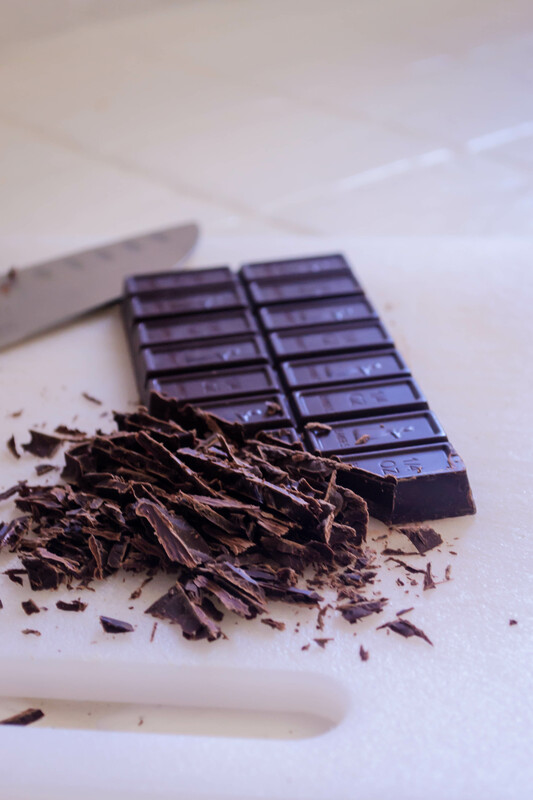 Then gently incorporate the chopped chocolate, and set aside. When the dough has doubled, punch it down by depressing your fist gently into its center to release trapped air, then let it rest for 5 minutes to get its breath back. Turn it out onto a floured board and roll into a rectangle of roughly 9×16 inches. 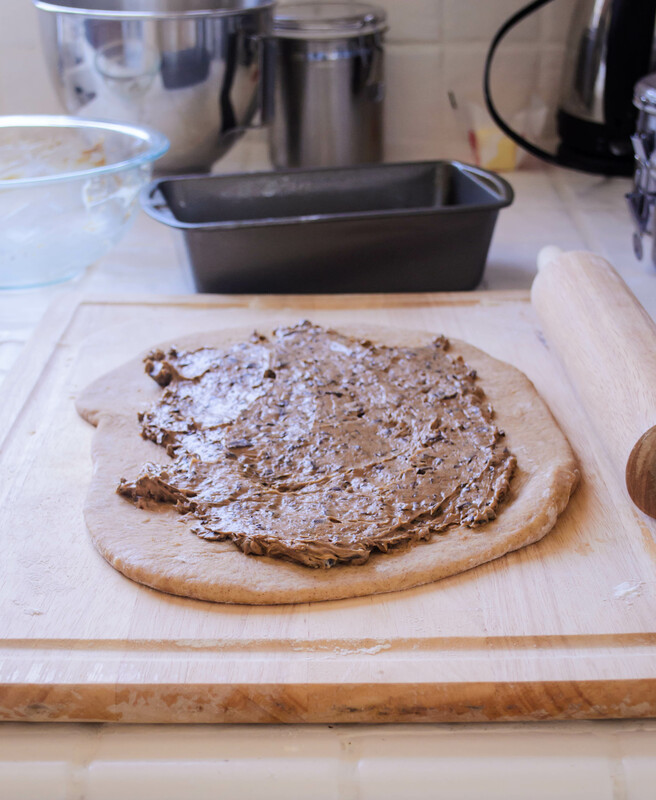 Spread the dough rectangle with the filling, leaving a border of about 1 inch on all sides to ensure minimal overflow. Working gently, roll up into a log starting from the short edge (so you’ll end up with a fat log about 9 inches long). Crimp the edges at the end to seal it – be aggressive! The dough might not want to stick to itself at first. Now that you have your fat log, well-sealed, twist it 4 or 5 times to disperse the swirl. This may stretch it out a bit, so when you carefully wedge it into a buttered 9×5 inch loaf pan, just tuck the ends underneath. Once the loaf is settled in the pan, rub the top with the remaining 1 tablespoon of soft or melted butter, then cover lightly with plastic wrap, set aside for another 30 minutes, and preheat the oven to 375F. By the time your loaf has risen for another 30 minutes, it should have come close to doubling in size again, and your oven should be fully preheated. Bake the loaf in the preheated 375F oven for 35-40 minutes, until the exterior is nicely burnished and the interior tests 180-200F (A skewer that comes out clean works too, though be careful, because the cream cheese filling will remain gloopy). Cool loaf in pan for at least 10 minutes, then remove from pan and cool on a wire rack for at least another 10 minutes. 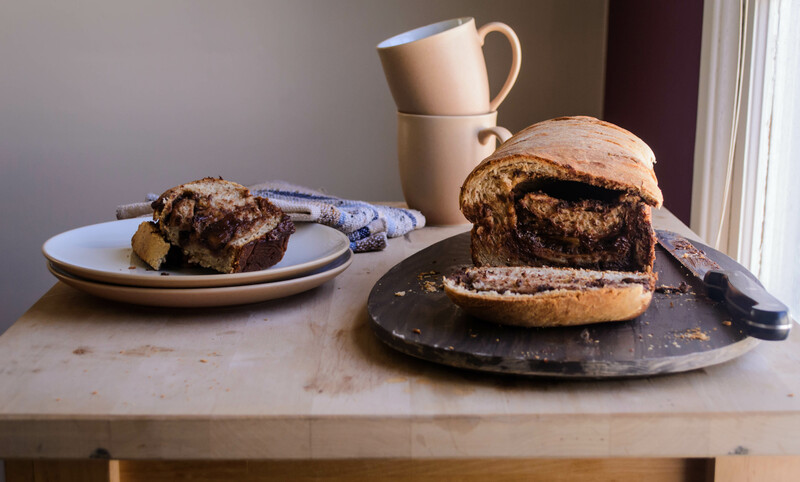 The cream cheese and chocolate need time to solidify a bit, or the layers within the loaf will threaten collapse. Enjoy with coffee, or tea, or milk, or your fingers. Keeps well in the fridge for 4 or 5 days (probably more would be fine, but ours didn’t last longer than that). Bring to room temperature before eating for best leftovers.